1. The Device — One way of choosing which operating system you'll use is simply by choosing your device. There is a whole array of products that run the Android operating system, and regardless of your budget, you can probably find something you can afford. iOS, on the other hand, is limited to Apple devices, be it iPods, iPads, or iPhones. Having an Apple device might make you feel some level of prestige, but a lot of times, users find it hard to justify spending three times as much on a product just because of the brand name when it does virtually the same thing as a cheaper device. 2. The Uses — Another way to narrow down what device you get will be based on its uses. At the moment, there are still many apps that are only available on either iOS or Android. 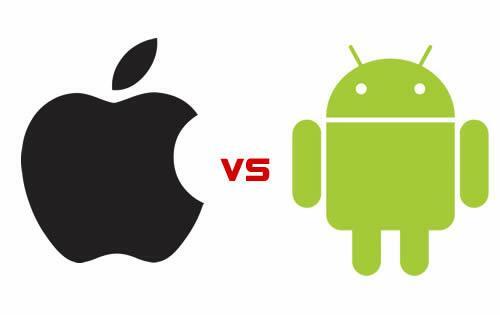 Apple's App Store offers more than a million apps, and apps usually hit iOS before Android—but with iOS, you can only use apps that you can find in the App Store, whereas with Android, you can download and install apps from third-party sources as well. Furthermore, you can expect Android to integrate your Google accounts like Gmail and Hangouts, making it easy to switch between your device apps and the Chrome browser on your computer—but iOS communicates with a Mac computer, should you have one, syncing information like contacts, calendars, and photos. 3. Security — Your phone or tablet is subject to malware in the same way as your computer is, and you'll want to be careful when downloading new apps. Apple checks out new apps before they're available for public use in the App Store; Google, on the other hand, searches within the Play Store for instances of malware. If you download an app from a third-party source, you have no idea what it may contain. This means that you're less likely to accidentally download a bad app on iOS than on Android—but as long as you keep to trusted sources, you're unlikely to encounter problems in any case. Additionally, whether you pick Apple or Android, you need to protect your device with a good VPN (Virtual Private Network), especially if you’ll be using any public or unsecured Wi-Fi. A VPN gives your connection to the internet an encrypted tunnel to travel through. This tunnel keeps out hackers and also gives you many other benefits. There are several VPN companies to choose from, so it’s easy to find the best one for you and your phone. 4. Shared Devices — If you'll be sharing your new device with a friend or family member, you may want to consider going with Android, which allows you the ability to create multiple user logins, keeping everyone's apps and information separate. This is not possible on Apple devices. 5. Longevity — If you plan to keep the same device for a long time but want to keep updating the system as new software comes out, you may want to consider choosing iOS. When you update to a newer version of iOS, you might not be able to use all of the new features depending on the technology available on your device, but you know for sure that if it's an Apple device, you'll be able to upgrade it through at least a couple new versions. With Android, however, your device may or may not be able to be upgraded to the latest version depending on what model and brand of system you're using. 6. Storage Space — The amount of available space a device has can be important, especially if you're planning to use a tablet in lieu of a laptop for any length of time. The largest iPad you can get is 128Gb, which may sound like a lot, but your computer probably has more space. If you've got a lot of photos or videos, that space will fill up fast—and iPad storage isn't modifiable. If you need more space, you'll probably need to get a wireless media hub. Many Android tablets, on the other hand, allow you to modify the storage by adding in microSD cards. 7. What's New in iOS 9 — iOS 9, which should debut sometime in late 2015, will have a lot of new features for iOS. That said, a lot of what will be new in iOS 9 are things that Android already does, eg. supporting widgets, offering public transportation options in Apple Maps, and better notifications via Siri. IOS 9 will also allow you to multi-task in the same screen, though, either by running two apps at once or by having a picture-in-picture setup so that you can watch some movies or TV shows while doing other things on the tablet, which is pretty nifty. You can do this on some Android devices like Samsung's Galaxy and Note devices, but this isn't the case with all Android devices. Although there's a whole world of options out there for smartphones and tablets, you'll find that if you have a clear idea in your mind of what it is you want, you'll narrow that list down fast. Figure out your budget and what you plan to use the device for and you'll be able to figure out a device that is perfect for you!